Greens are a great way to celebrate the spring gardening season. 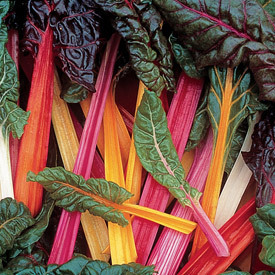 Get some Chard into your vegetable beds for a true spring awakening. The deep green leaves and crispy stalks of chard are easy to grow in any well-drained soil. Just be sure to thin young plants regularly so they'll have room to spread and grow 2 to 2 ½ feet tall. You can begin harvesting the outer leaves when young plants are well established and have 6 to 8 leafy stalks. These flavorful, mild, juicy plants will be ready to enjoy in the kitchen in just 50-60 days from sowing. Chard plants grow well in a wide range of conditions and can take the last spring frosts in stride. Their pretty leafy stalks will continue to provide bountiful harvests for months, right through summer heat. Chard can be prepared quickly, and both the crunchy succulent stalks and rich green leaves are great eating. add a little chicken or vegetable broth and braise until tender.